SalesForce’s system, one of the most advanced customer management systems in the world, integrates directly to ActiveTrail, so that your customer list can synchronize automatically between the two systems. Integration to SalesForce saves you the trouble of rebuilding your customer list and provides easy access to your customer pool, directly from SalesForce to the email marketing system. 1. Click on “Contacts” in the top menu and then on “Import”. 2. 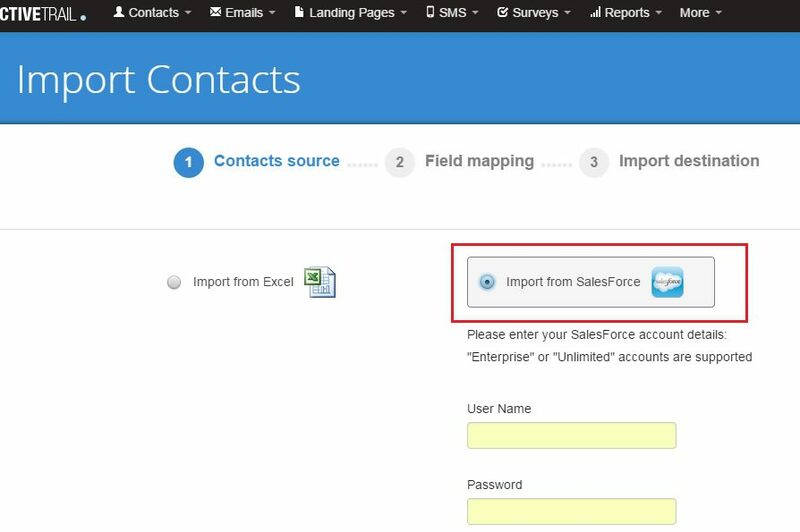 Click on “Import from SalesForce” and type in your username and password. 3. Choose which fields to synchronize between the two systems: email, birthdate, phone, etc. 4. Choose a recipient list and group to import your customers into: choose an existing group/list or create a new one. ActiveTrail’s system has done all the hard work for you, all you have to do is use your recipient lists and start marketing!